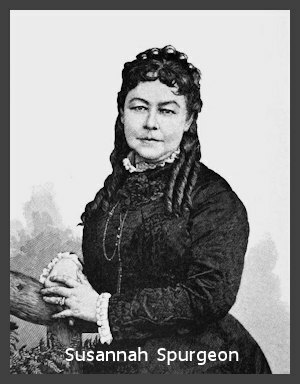 Susannah Thompson Spurgeon (1832-1903), Author, book supplier, and devoted wife of C. H. Spurgeon. They were married in January, 1856 and they had twin sons, Charles and Thomas. She started a Book Fund to give theological books to ministers, preachers and missionaries and by 1902 had distributed more than 10,000 volumes. She wrote three books, including A Basket of Summer Fruit.